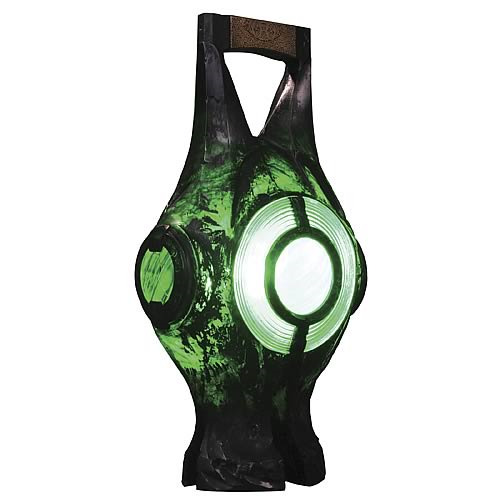 Shopping for Green Lantern Prop Replicas? Limited edition Power Battery Prop Replica lights up! Straight from the Green Lantern movie. Comes with a Green Lantern Power Ring! Power up! Straight from the Green Lantern movie, this full-sized, light-up Green Lantern Power Battery Prop Replica was created from a cast of the actual prop used in the film. The Power Battery comes with a Green Lantern Power Ring that lights up the lantern when pressed against the lantern's face! The hand-painted, cold-cast porcelain reproduction measures about 15-inches tall x 7 1/2-inches wide x 5-inches long, with the ring a men's size 14. It's a limited edition of 2,500 pieces that comes packaged in a 4-color box.